KaarbonTech is a sponsor of the 2018 National Tree Officers Conference (NTOC). KaarbonTech supply asset management solutions and surveying services to the local authority market. In fact, KaarbonTech systems manage approximately 33% of the local authority highway network for one or more asset. We are predominately involved in drainage, tree and grit bins and provide surveying services to these market sectors. 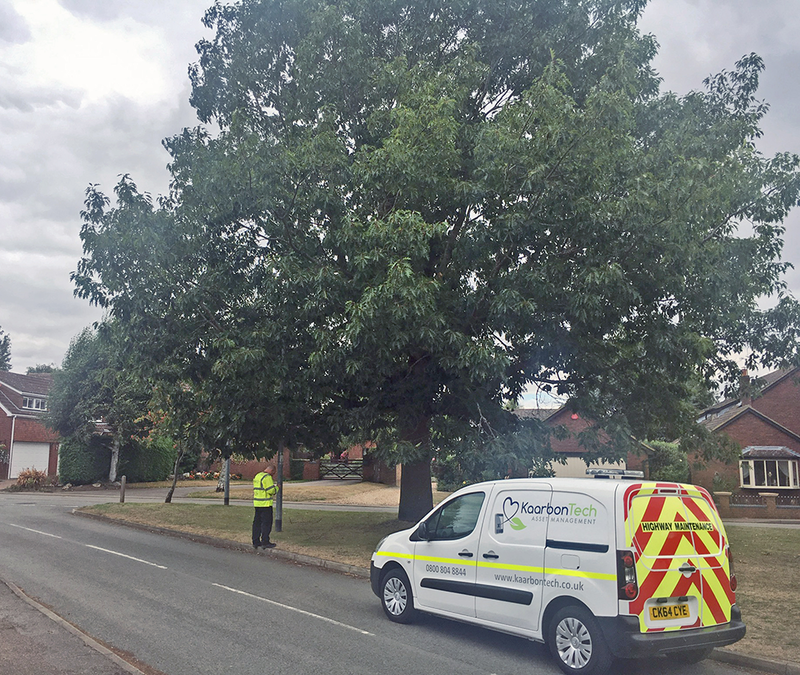 We are currently working with Central Bedfordshire (CBH) council on a highway inventory survey using our own surveyors and our Tree SMART asset management system. When we started with CBH they had no tree inspection data, so they not only wanted survey software but also a highway inventory survey. Due to the proposed length of the project, KaarbonTech decided to employ our own Lantra PTI level 3 arborists and subcontractors to perform the tree surveys. The Tree SMART system is an android/IOS app that allows surveyors or council arborists to inspect tree’s and capture the appropriate data. The system is cloud-based but has an “offline” mode to enable surveying in areas without cellular connectivity. OS mapping is provided to MasterMap topographical level to allow the GPS accurate plotting of tree’s and groups. The office system is accessed via any web browser and has been designed to be simple to use and yet provide extremely powerful reporting tools. When the CBH tree survey commenced, the KaarbonTech surveyor in conjunction with contract surveyors were set a target of at least 100 inspections per day. This was a substantial target especially during the winter months due to the reduced daylight available. However, the surveyors soon got to grips with the software and were achieving more than 100 inspections per day in no time at all. The council were able to monitor the inspections in near real-time and were soon producing reports and analysing the data. If our surveyors find issues with tree’s that could be dangerous or need immediate remedial work, they can use the office system to produce an instant tree defect report and send this to the council for actioning. Likewise, if the council arborists want our tree surveyors to attend a specific tree or trees to perform an inspection they can raise a “work package” and allocate it to a surveyor in a particular area completely wirelessly. The council arborists will continue using the system to keep the inspection information up-to-date extending the data capture to tree works contractors who will be given a Tree SMART tablet to receive work packages detailing the work required on each tree. As the work is performed, the tree works teams will complete the outstanding tasks on and the system will be automatically updated providing a full audit trail. Disclaimer: The views and opinions expressed in this article are those of KaarbonTech and do not necessarily reflect the views of the Institute of Chartered Foresters. Keep your eyes and ears open for new opportunities!